Irvine’s Only Coastal Canyon Village. Rising above a rare Laguna Canyon environment, yet minutes from Laguna Beach, a romantic hideaway echoes the splendor of its natural setting. It is a destination. A retreat. An exclusive, gated Village that is utterly unique in Orange County. 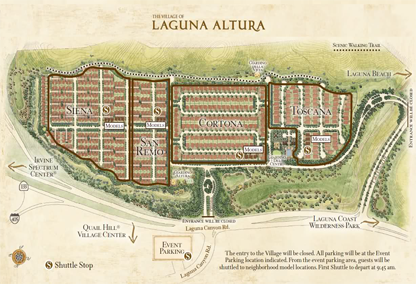 Upholding the continuing legacy of the Villages of Irvine® for superb planning and quality of life, the Village of Laguna Altura offers residents the highest expression of architectural authenticity and superior recreation.